Climate change rocks and hard places. This was me in Crikey today. It’s a spin-off of the Coalition demographic trends we looked at earlier. Voter support for the Coalition has been undergoing a long term demographic shift over the last 21 years, and not a particularly fortuitous one at that. 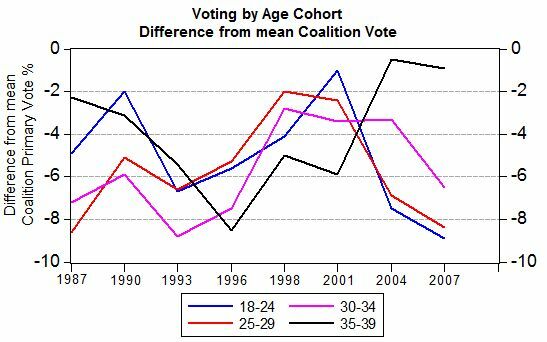 At every election since 1987, those aged under 40 have voted less for the Coalition as an age group than has the country as a whole. That’s to be expected. That older groups in the country hold up the Coalition vote is hardly rocket science. The problem comes in how that combines with the changing voting patterns of the over 40 age groups during the last 21 years. 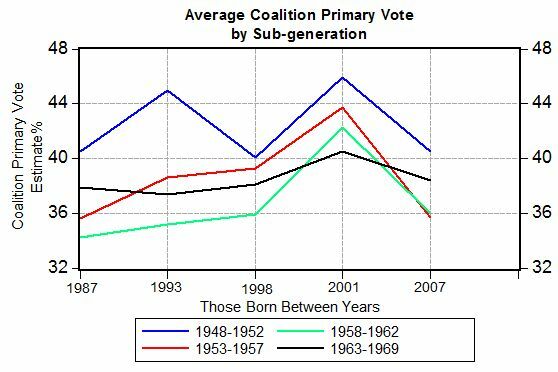 The Coalition has dominance in the pre-Baby Boomer age cohort, this group overwhelmingly votes for the Coalition, usually in the high 40’s to mid 50’s on the primary vote, and shores up the total Coalition primary vote as a consequence. However, as this group is ageing and reducing in size through attrition, the Coalition has failed to find new demographics of support to completely replace the votes they are losing, and will continue to lose, as this group of pre-Boomers reduces in total size. Ordinarily we might expect that people will vote more conservative as they get older, and while this is partially true, these younger groups are coming off a much lower level of base support for the Coalition than the pre-Boomers did. If we play with the Newspoll data provided in Ian Watson’s excellent paper “Is demography moving against the Coalition?” published at Australian Policy Online, we can track how certain age groups have changed their voting behaviour over time. So while it’s true that these groups are slowly moving towards the Coalition, in raw number terms it doesn’t account for the number of votes being lost in the pre-Boomer generation through the continual reduction in size of that group. We can see this by taking the difference from a number of age cohorts, from the average of the Coalition vote. Groups with negative numbers are that many percentage points below the Coalition primary, those with positive numbers are that many percentage points above the Coalition primary. As we can see, only the 55-59 and 60+ age groups are pulling the Coalition primary vote upward, with all other groups over 40 having slowly moved from supporting the Coalition vote to reducing it. The 2007 election may well be the last election that the 55-59 age group drags the Coalition average primary vote upward. Also noteworthy is how the distance between the pre-Boomers level of support and the rest of the community is growing. 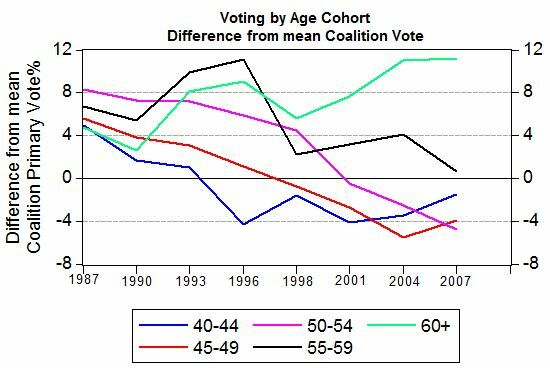 For age groups below 40 years of age, they all vote below, often far below the Coalition average. So we have the Coalition facing a long term demographic trainwreck on their primary vote if they don’t start generating far higher levels of support among younger demographics. And it really is a trainwreck — if the long term trends of the last 21 years continue for the next 10, the Coalition will become mathematically unelectable. And this brings us right into the politics of climate change and any emissions trading system. Newspoll has undertaken two important qualitative surveys this year, one on demographic concern about climate change in February, and another on the support of an emissions trading system in June. We can summarise the results in a spiffy chart. 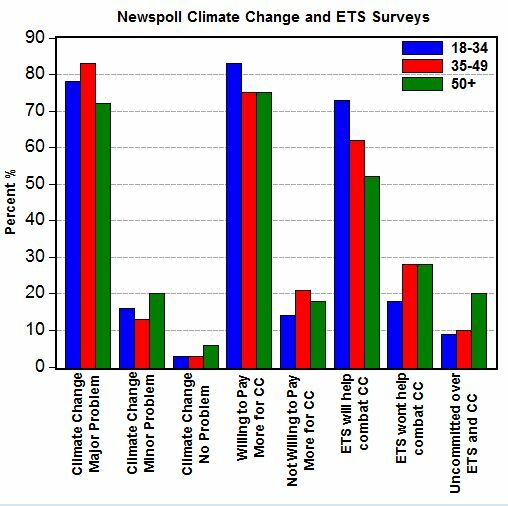 The two groups that have the most concern about climate change generally are the two youngest demographics that the Coalition must improve their standing with if they are ever again to become a government. Similarly the youngest demographic has the highest level of support when it comes to their willingness to pay more to address climate change. But the big kicker here is the survey results from the emissions trading poll, where the younger the demographic, the more they believe that an ETS will combat climate change, and the more committed they are to having an opinion in the first place. If the Coalition starts trying to make political mileage out of any proposed emissions trading system, they risk alienating the very demographic groups that their standing must, absolutely must improve dramatically in if they are ever to become a government again. The Opposition have so far tested a few political lines, trying to angle some partisan benefit out the ETS, but their target here is already the least likely to believe climate change is an issue, are the least willing to pay for it and are the least likely to believe that an ETS will combat climate change. Partisan preaching to the converted will continue to deliver the Coalition nothing in return, as the converted have nothing to give. Workchoices will already hang around the necks of the Coalition like a piece of smelly roadkill for the under 40s for years to come — partisan games over climate change risks kissing that demographic goodbye, and with it any chance of government for a considerable period. The Coalition might believe that their base is important, but pandering to that base is simply an exercise in palliative care for their primary vote over the long term.